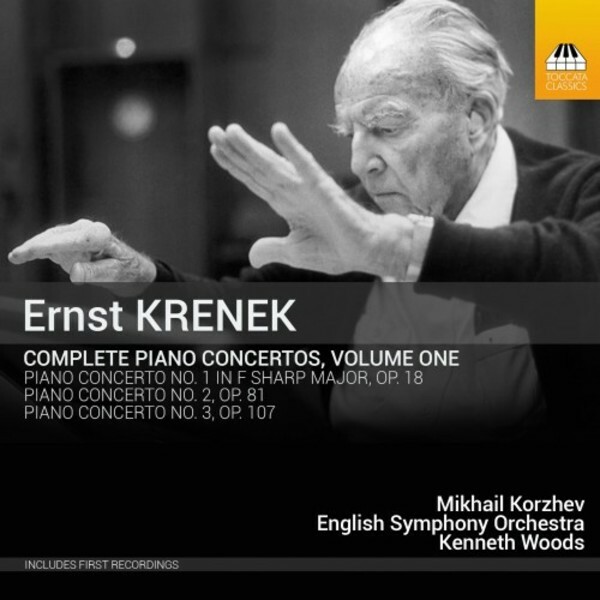 The piano concertos of Ernst Krenek (1900–91) are major contributions to the twentieth-century repertoire, comparable to those of Bartók, Prokofiev, Schoenberg and Shostakovich. Astonishingly, two of them have never had commercial recordings – an omission this series seeks to redress (a second volume is now being planned). Piano Concertos Nos. 1–3, written between 1923 and 1946, show Krenek throwing off the constraints of tonality in favour of a freewheeling, individual use of twelve-tone technique. All three works brim with colour and are often animated with a keen sense of wit. This CD sees the first collaboration between Russian-American virtuoso Mikhail Korzhev and US-British conductor Kenneth Woods. Mikhail Korzhev is equally active as a solo recitalist, a chamber musician and orchestral soloist. He has served on the faculties of the University of Southern California, Chapman University and currently is on the faculty of California State University at Fullerton. Since 2008 he has been a faculty member at Beverly Hills International Music Festival. He holds a doctorate in piano performance from the University of Southern California, where he studied with Daniel Pollack. His previous recordings for Toccata Classics were of music by Gerard Schurmann, and a CD of Schurmann’s Piano Quartets is currently in preparation.